Dear people who pray, praise, and give thanks: grace, mercy, and peace to you from God the Father and our Lord and Saviour Jesus Christ. Amen. The true Christian church, or God’s holy people, is recognized by prayer, praise, and thanksgiving to God. God has given the command to pray, and He has given His promise that He will hear the prayers of His people. Thus, the church prays. God has sent His only Son to die for our sins and He gives us eternal life, so the church praises God for His salvation. God has poured out on His church both temporal and eternal blessings, so the church responds in thanksgiving. Therefore, you can recognize the true Christian church by prayer, praise, and thanksgiving to God. The church prays. Not with unintelligible babbling that is fruitless for the mind. Not with lofty words of show. The church prays humbly, but with all boldness and confidence asking our heavenly Father as dear children ask their dear father. We can pray to God with all boldness and confidence because He has commanded us to pray and has promised to hear us. If even sinful fathers know how to respond to the requests of their children with good gifts, do you think God will do worse? If even sinful fathers won’t give their children things that are harmful, do you think God will give us what is harmful for us? Thus we can pray with all boldness and confidence. God will hear our prayers and answer in the way that is best. The church praises God. Not with unintelligible babbling that is fruitless for the mind. Not with empty repetitions of meaningless nonsense. A great problem in Luther’s day was that the church conducted worship in Latin, even though the common people did not know Latin. Even nuns and monks who memorized services never knew what they were saying, so Luther called it droning that is not prayer or praise to God because they could not understand what they were saying and consequently could learn nothing from it. The church in our day doesn’t have that same problem. Rather, we have everything in our native language, but so much of it is nonsense that it might as well be in a foreign language since we can learn nothing from it. Many congregations have discarded the divine liturgy and replaced it with the weekly whims of a music band. The best hymns that point to Christ and His means of grace have been replaced with empty songs that emphasize feelings and emotions. The best hymns that tell us about what Jesus has done for us have been replaced with songs about us. We also have not been immune to this, even though we have been working on learning good hymns and weaning ourselves off the empty sentimental stuff, but it is a work in progress. It is an important work in progress, however, because it is important what the church of God sings. Hymns teach, so it is important what they teach. Our hymns of prayer are prayers to God, and it is important what we pray. Our hymns of praise and thanksgiving are prayers to God, and we need to remind ourselves why we praise God and why we give Him thanks. We need to pay attention to what the hymns teach. Otherwise, with some hymns, we will be tempted to just look at the number of verses and complain that the hymn is too long and it will feel like a chore and burden to sing it. The church of God prays, praises, and gives thanks. We gather primarily to receive God’s gifts to us in Baptism, Absolution, and the Sacrament of the Altar, but we also respond with prayer, praise, and thanksgiving. If our prayer, praise, and thanksgiving is a response to God’s gifts, it should sound like a response to God’s gifts; it should draw our attention to God’s gifts. It is not easy to pray without ceasing. John Bunyan said, “Prayer will make a man cease to sin, as sin will make a man cease from prayer.” This is true. Sin is the reason why we don’t pray as much or as often as we should. When we fall into sin, we are hesitant to approach God immediately in prayer because of our guilty conscience. We struggle to pray to God for the removal of sin that our sinful flesh wishes to retain. However, when we are in a continual spirit of prayer, we are always ready to pray. When good things happen to us, our first reaction is to pray. When bad things happen to us, our first reaction is to pray. When temptation comes, our first reaction is to pray. Prayer is critical for our relationship with God because it keeps Him and His will for us in mind, and reminds us that we are His holy people. Only God’s holy people can pray. Romans 8 says, “How then will they call on Him in whom they have not believed?” (v.14) How can someone pray to God when they do not know God? They cannot. Prayers to someone out there up high in the sky are not prayers to God. Only God’s children can pray to God. Prayer is based on God’s promises in Christ Jesus. We can pray to God only through Jesus, because only He has died to forgive us our sins. We cannot pray to God on our own merits. The only reason why God hears our prayers is because our sins are covered by the blood of the Lamb who takes away the sins of the world. God hears our prayers because of Jesus, and only because of Jesus. Thus, it is a mark of the true Christian church that she prays, praises, and gives thanks to God. These all flow from the forgiveness of sins that God’s holy people have. Because we are forgiven, we pray. Because we are forgiven, we praise God. Because we are forgiven, we give thanks to God. The Christian holy people is recognized by prayer, praise, and thanksgiving. Where people gather to pray, praise, and give thanks to God according to His Word, there is God’s holy people; there is the true Christian church. Amen. *Our midweek Lenten series is based on Martin Luther’s On the Councils and the Church, as found in the primer A Christian Holy People, which is available from Lutheran Press both affordably in print and free electronically (lutheranpress.com). Dear people with blind faith: grace, mercy, and peace to you from God the Father and our Lord and Saviour Jesus Christ. Amen. God is just. He is righteous. He is fair. Knowing this, upon seeing the man blind from birth, the disciples asked Jesus, “Rabbi, who sinned, this man or his parents, that he was born blind?” God is just. He is righteous. He is fair. Thus, the disciples thought the blind man was obviously getting what he deserved. Keep in mind that in that day there was no welfare system to take care of this man. There were no disability benefits for which he could apply. There was no centre for the blind, no school for the blind, no seeing eye dogs, no government assistance for the blind. This man was born blind and the only thing he could do for food was beg on the side of the street and hope that enough people had pity on him to toss a couple coins in his direction so that he could eat. God is just. He is righteous. He is fair. So, the disciples thought this man must have deserved what he got. God punishes sin, and here you can see it. Either his own sins are the reason, or his parents’ sins are the reason he had been suffering in complete darkness from birth, relying on the compassion of strangers just to eat. The explanation for such an awful situation must be payback for something. Is that how we tend to see things? Any suffering that someone else goes through must be deserved. Any tragedy that strikes others must be divine retribution for their sin. Either they sinned, or their parents sinned, but they are getting what they deserve. This is easy to understand. Sin results in the just punishment of God. What we do has consequences. This is justice in our eyes. If I don’t smoke, I won’t get cancer. If I eat healthy and exercise, I won’t have a heart attack. If I don’t drink and drive, I won’t be in a collision on my way home. It’s the smokers who get cancer, the unhealthy eaters who get heart attacks, and the drunk drivers who end up in collisions. The problem with seeing things this way, is that we know that things don’t work out this way. Non-smokers die of cancer every day. Young athletes have heart attacks. Innocent families get hit by drunk drivers. That must be just bad luck, many will say. You can do things to decrease your chances of getting cancer or a heart attack or being in a collision, but in the end, it just comes down to pure dumb luck. You may not be a high risk for a disease, but if you do get it, it’s just unpredictable chance and bad luck. Jesus’ answer to the disciples, however, was not that the man was blind because of his sin or his parents’ sin. Neither was His answer that the man was blind out of pure dumb luck. Jesus told the disciples that it was so that the works of God might be displayed in him. In other words, God made the man blind so that He could display His work in the man. Well that’s not fair, we might be quick to say. We prefer to say that God allowed the man to be blind. Whoever did it, it cannot have been God. God wouldn’t do such a thing. But God allowing something is still His doing. Nothing happens apart from God’s will. Do you remember Job? He lost his oxen and donkeys to raiders as well as the servants who cared for them. Fire from heaven burned up his sheep and the servants who cared for them. Another group of raiders took his camels and killed the servants tending them. A great wind blew over the house of his oldest son and killed all ten of his children. Job was struck with loathsome sores from the bottom of his foot to the crown of his head. And Scripture says that God brought all this disaster upon Job (Job. 42:11). God did it. It wasn’t Job’s sin. It wasn’t coincidence or chance. God did it. According to our sense of justice, righteousness, and fairness, we say that this is not just, it is not righteous, it is not fair. We don’t just say that about what God did to Job. We say it about what God has done to our loved ones. We say it about what God has done to us. We say it’s not fair that my loved one died. It’s not righteous that she suffered so long. It’s not fair that I have cancer. Did we sin or did our parents sin so that we suffer like this? We can go right back to our first parents, Adam and Eve, and say yes, our parents sinned, and that sin has been passed on from generation to generation, so that we also have sinned. That is why we suffer. We suffer because we are sinful. We will die because we are sinful. If we were not sinful, we would never suffer and we would never die. This does not give us the complete answer, however. The truth is that we will not receive a complete answer on this side of heaven to why we suffer in the ways that we do. We will not know the answer because we are blind. We might sing, “I once was blind, but now I see,” but that’s not true. We don’t see. Jesus says, “If you were blind, you would have no guilt; but now that you say, ‘We see,’ your guilt remains.” Don’t say that you see, because you don’t. If you say that you see, your guilt remains. If you could see, you would never question God’s justice, righteousness, or fairness. You would see that all that you suffer is so that the works of God might be displayed in you. What is the work of God? Jesus says, “This is the work of God, that you believe in Him whom He has sent.” (John 6:29) Everything God does is so that we would believe in Him, but we don’t see it. We’re blind to it. The work of God is that you believe in Him whom He has sent. The work of God is that you believe in Jesus. This might be easier to understand first from someone else’s suffering. That’s why we have the example of Job. God took away all of Job’s earthly possessions, yet Job still believed in God and trusted in Him. That displays God’s work of faith. God killed all of Job’s children in one great blow, yet Job still believed in God and trusted in Him. That displays God’s work of faith. On top of all this loss, God struck Job with loathsome sores from the bottom of his foot to the crown of his head, yet Job blessed God, he did not sin, and he did not charge God with wrong (Job 1:21-22). God displayed his work in Job. God displays His work in us also. We suffer in this life. We cannot say it is because of some sin that we committed. We certainly cannot say that it is just random dumb luck. If it is by random chance that we suffer, then it is by random chance that our suffering ends. We suffer at the hand of God, so that He would display His work in us. God’s work is displayed in us when we accept that we cannot know all the reasons why we suffer as we do, but we trust that God knows better than we do. God’s work is displayed in us when we accept that we are blind to what God does but we accept from His hand both days of gladness and days of sadness. God’s work is displayed in us when despite what we suffer, we say with firm confidence that God is just. He is righteous. He is fair. You can trust that everything that God does is for your good. He sent His only Son to suffer and die for you. What more could He do for you? The Son of God voluntarily came to take your sins on Himself and receive the punishment that your sins deserve. Jesus suffered and died for you so that you have the promise of leaving this world of suffering, sorrow, and death. His death gives you the promise of an end to suffering and a reunion with all your loved ones who have died in the faith. Because of what God has done for you, you can blindly trust Him. Even though you cannot see now, one day you will see clearly that He has loved you dearly. Despite what you cannot see, you can trust God’s promises to you. His promises to you are sure and certain, because Jesus died for you. Amen. Dear people served by Christ through His called ministers: grace, mercy, and peace to you from God the Father and our Lord and Saviour Jesus Christ. Amen. The true Christian church, or God’s holy people, is recognized by the fact that she consecrates or calls ministers. Why is this a mark of the church? Because Christ instituted the office of pastor. There must be one who publicly and privately administers, gives, and exercises the Office of the Keys, Holy Baptism, and the preaching of the Word, those marks of the church that we have heard about in previous sermons, as well as the Sacrament of the Altar which we will hear about in Maundy Thursday’s sermon. The church did not sit down in a council one day and decide that they needed to create an office or position of pastor. Rather, Christ Himself instituted the office of pastor. Ephesians 4 tells us that Christ gave not only the apostles, the prophets, and the evangelists of the past as gifts to His church, but also pastors (Eph. 4:8-11). Why is a pastor a gift to the church? Because he equips the saints, he does the work of ministry, and he builds up the body of Christ are the reasons given in Ephesians 4 (v. 12). In other words, a pastor is a gift to the church because Christ gives His gifts through the pastor to His church. Since the office of pastor was instituted by Christ, He is also the one who decides who can fill the position. First Corinthians 14 (vv.33-40) and First Timothy 2 (vv.11-15) exclude women from the office. First Timothy 3 excludes unsuitable men: those who are not above reproach, who are divorced, or who are not sober-minded and self-controlled; those who are not respectable, hospitable, or able to teach; those who are drunkards, violent, quarrelsome, or lovers of money; those who do not manage their household well or keep their children submissive with dignity; and finally, those who are recent converts or those not well thought of by outsiders (vv. 1-7). While holiness of life is indeed expected of all Christians, there are special requirements for the office of the holy ministry. Christ does not want His sheep hurt or misled by the shepherds that are supposed to take care of them. Pastors who cannot teach God’s Word properly or do not set an example of good works and holy living can lead others into false belief, despair, and other great shame and vice. Pastors are instructed to be an example to their flock in speech, in conduct, in love, in faith, in purity (I Peter 5:3; I Tim. 4:12). The church neither shall, nor can, tolerate public vices in her ministers. Further, a pastor does not decide what to preach or what to teach. He may decide which text to preach on. He may decide which book of the Bible to study for Bible class. But God’s Word is God’s Word and that is what the pastor is to preach and teach. The pastor doesn’t decide what is right and wrong. He doesn’t decide if infants should be baptized or not. He doesn’t decide whose sins should be absolved and whose should be retained. He does not even decide who should commune and who should not commune. All these things have already been decided by God’s Word. The only question is if the pastor is going to be faithful to what God has called him to do as a steward of the mysteries of God (I Cor. 4:1), or if he is going to be faithless and serve his own belly (Rom. 16:17-18). As it comes to preaching and teaching, Saint Paul instructs the young pastor Timothy, “Follow the pattern of the sound words that you have heard from me, in the faith and love that are in Christ Jesus.” (II Tim. 1:13) Scripture gives us a sound pattern of words. Don’t try to be creative. Preach the Word. Don’t try to be edgy. Preach the Word. Don’t try to entertain. Preach the Word. Christ did not say teach them to observe those things that they want to observe. He didn’t say teach them those things that are socially acceptable and tolerable; those things that people don’t find offensive. Christ did not say teach them to observe what you think they should observe. Christ’s instruction and command is for His ministers to teach people to observe all that He has commanded. There is no picking and choosing. How can Christ command such a thing? As He said, “All authority in heaven and on earth has been given to me.” He is the one with the authority. The church is His. The people are His. The pastors are His. Thus, what is taught by His pastors to His people in His church is up to Him, not to anyone else. Christ gives such clear instructions for pastors to follow because He knows better than pastors. A pastor may have the temptation to let something slide or to avoid dealing with some matter because it is difficult and will cause conflict. “Maybe if I’m just friendly to them and ignore the obvious sin then I can win them over and they’ll repent.” Trust me, every faithful pastor in the history of the church has had the temptation to let things lie. Christ knows better. Christ knows better how to save than we do. Christ has given us His Word which leads to repentance and saves. A pastor’s friendliness will never save anyone, but the Gospel saves. Baptism saves. Christ saves through His means of grace. Note Christ’s promise which He gives to His ministers and to His church, “Behold, I am with you always, to the end of the age.” Until the end of the age, that is, until the end of time, until the end of the world, Christ will be with His church. Christ will be in His church giving His gifts that He earned on the cross through His called and ordained servants. Christ speaks His absolution through the mouth of the pastor. Christ baptizes in His name with the hands of the pastor. Christ gives His body and blood to eat and drink from the hands of the pastor. Thus, it is a mark of the true Christian church that she calls pastors to faithfully preach God’s Word, exercise the Office of the Keys, and administer the sacraments. Where the church consecrates or calls pastors to faithfully give these gifts of Christ, there is the true Christian church. This must be so because Christ Himself gives His gifts through the office that He instituted to care for His people in His church. Because Christ uses pastors to give His gifts of the forgiveness of sins, life, and salvation, the office of pastor is necessarily found in the Christian church. A Christian church is recognized as such because Christ calls ministers to faithfully serve His people there by giving His gifts. God’s holy people cannot be without faithful pastors and faithful pastors cannot be without God’s people because together they are the church, the holy people of God. That is how you can recognize the true Christian church. Amen. Dear people who drink the living water: grace, mercy, and peace to you from God the Father and our Lord and Saviour Jesus Christ. Amen. We listened in on a very personal conversation between Jesus and the woman of Samaria in our Gospel reading today. A sensitive matter, although to our ears Jesus may sound insensitive. Jesus, knowing all things including the situation of this woman, said to her, “Go, call your husband, and come here.” She’d had five husbands. Jesus knew this. She was with a man now to whom she was not married. Jesus knew this. She did not have a husband to call and bring to Jesus. Jesus knew this. Yet, Jesus told her to go and call her husband and bring him. When the woman admitted that she had no husband, Jesus aired her dirty laundry. Jesus dragged up the sin of her past and present and confronted her with it. They were just having a conversation about water, and then Jesus turned the conversation into an uncomfortable accusation concerning her sin. The woman’s natural reaction was to deflect. She responded, “Sir, I perceive that you are a prophet. Our fathers worshiped on this mountain, but you say that in Jerusalem is the place where people ought to worship.” Jesus’ conversation was not a comfortable one for her, so she turned it around to talk about Jesus and about places of worship. When God’s Law hits you and you know you’re guilty, it’s far easier to change the subject than deal with the brunt accusations of the Commandments. It’s easier to talk about other people or about something that surely the man of God would want to talk about – the worship of God. The thing about the accusations of the Law is that they’re not supposed to be comfortable. God didn’t give us the Law to comfort us. He gave us the Law to terrify us of our sin. He gave us the Law to show us that we are sinful and we need a Saviour, someone to save us from sin; someone to save us from ourselves. This woman of Samaria could not change her past. She couldn’t change the fact that she had had five husbands. Whatever had happened between her and those men could not be undone. The baggage of her past was the baggage of her past and the Law of God does nothing to alleviate the weight of that baggage. Quite the opposite. The Law of God adds an infinite amount of weight to the baggage of our sin. The Law of God shows us that we cannot carry the weight of even one of our sins, even those that we foolishly imagine are tiny sins. The Law of God piles on the weight and only one of two things can happen. Either we cling to our baggage of sin and are crushed under its weight, or Jesus takes it from us because He is the Saviour that we need. Either we cling to our sin of past and present and go to hell for eternity, or Jesus takes the weight of our sin from us, every last gram, and we live eternally without the baggage of sin. This comfort and taking away of the weight of sin does not come from the terrifying accusations of the Law. This comfort comes from the Gospel, the good news that tells us that Jesus has already carried the weight of our sin. He carried it to the cross and died with the whole world’s weight of sin on Him. Jesus suffered for us and in our place so that we would not have to carry the weight of our own sins into hell. The woman could do nothing about her past sin, but she could do something about her present sin, the sin that she was in at that very moment. With Jesus offering to take away the baggage of all her sin, not just her past sin, why would she cling to her present sin and refuse to turn away from it? The woman was no longer deflecting. She was no longer avoiding the topic of her sin. In fact, she was going around openly talking about her sin. She had been confronted by God’s Law but she no longer had reason to deflect or attempt to hide her sin. Her sin had been exposed by the Christ, the one who came to bear her sin, and our sin. Earlier, the woman did not realise that she needed a drink of water. She knew she needed water from the well, but she did not know that she needed living water from Jesus. She did not know that she needed forgiveness. She thought she didn’t need forgiveness because she hid her sin and deflected the accusations of God’s Law. But God’s Law exposed her sin. She thought she didn’t need forgiveness because she worshiped God. Jesus told her, “You worship what you do not know.” Jesus told her that she cannot hide behind her religion. You cannot worship in Spirit and truth when you’re living in sin. She needed a drink of living water from Jesus but she didn’t know it until Jesus exposed her sin with God’s Law and rejected her appeals of worshiping God as a cover for her sin. We cannot fool God. We can fool ourselves if we deflect God’s Law or think it doesn’t apply to us. We can fool ourselves if we tell ourselves that we aren’t so bad or sinful. We can fool ourselves into saying that everything is okay because of our religion – because we come to church; because we worship God. We cannot fool God. We cannot worship in Spirit and truth if we do not repent of our sin. If God’s Law has not struck us with its accusations, its discomfort, and its terror, we don’t even know we need living water from Jesus. If that Law has not killed us, we do not know that we need new life from the one who gives living water. However, once the Law of God has done its work, there is no more hiding sin, denying sin, or deflecting God’s Law. There is only sorrow over sin. There is terror because we realize that we deserve hell. Then we realize that we need living water; living water which only Jesus can give us. Jesus gives us living water wherever He gives us forgiveness. All the benefits of everything He has done for us are given to us in the means of grace, which are the Gospel, Baptism, and The Sacrament of the Altar. The benefits of His perfect life are given us in the means of grace. The benefits of His suffering and death are given us in the means of grace. The benefits of His resurrection and ascension are given us in the means of grace. Those benefits are the forgiveness of sins, eternal life, and salvation. Because Jesus gives us the forgiveness of sins, past and present, through the means of grace, He gives us living water which means we will live forever with Him in eternity. Our thirst for forgiveness is quenched. God’s Law is not pleasant to hear. It is not comfortable to hear. Yet, without it we would not know of our need for the living water of forgiveness. Without it we would not know of our need for Jesus. God’s Law is so important because it leads us to the living water which Jesus gives. The discomfort of the Law is to lead us to the comfort of the Gospel. The Law shows us that we are parched, so that we will receive living water from Jesus, as we receive the forgiveness of sin. Amen. Dear baptized saints: grace, mercy, and peace to you from God the Father and our Lord and Saviour Jesus Christ. Amen. The true Christian church, or God’s holy people, is recognized by the sacrament of Holy Baptism. Wherever Baptism is rightly taught, believed, and used according to Christ’s institution, there God’s holy people are. Baptism is a public mark by which God’s people are made holy and washed clean from sin and death, as we are made clean by the innocent, holy blood of the Lamb of God. Wherever you see the mark of Baptism, know that the Christian holy people must certainly be there. Is Baptism, then, always certain? A controversy arose in the Early Church about the certainty of Baptism if performed by a bishop or pastor who denied Christ under persecution. A group called the Donatists said that if a pastor denied Christ under persecution then he does not have the Holy Spirit. If he does not have the Holy Spirit, he cannot pass the Holy Spirit on to those he baptizes. If he cannot pass the Holy Spirit on to those he baptizes, those Baptisms must be invalid. They thus questioned the validity of God’s Word and sacraments if administered by an unfaithful pastor. The answer is that you should not be concerned about the person who baptized you. Baptism doesn’t belong to the one baptizing, but to the one baptized. Baptism is given as a gift to the one baptized, not to the one who is baptizing. Baptism was instituted by Christ and has His command and promise, therefore it cannot depend on the one who administers it, as long as it is administered according to Christ’s institution. If Baptism depended on the one administering it, you could never be certain that your Baptism is valid. You cannot see the heart or faith of the pastor who baptizes. Baptism cannot depend on the faith or piety of the one whose hands God uses to administer His gift. Baptism depends on the institution of Christ and His promises. Luther writes that this is true even if the Gospel-denying pope baptized you himself. So long as Christ’s institution is followed, that water is used and you are baptized in the name of the Father, and of the Son, and of the Holy Spirit, it is a valid Baptism. The Donatists were wrong in saying that if a pastor does not have the Holy Spirit then he cannot pass the Holy Spirit on to the one he baptizes. It is not the pastor who passes the Holy Spirit on to the one baptized. A pastor has no such power. The Holy Spirit is not at the pastor’s beck and call to come and go as the pastor sends Him. The Holy Spirit proceeds from the Father and the Son, not the pastor. The Holy Spirit effects faith where and when it pleases God, and God has so decided that Baptism is an instrument through which He gives faith. Further, you are not baptized in the name of the one who administers Baptism, but in God’s name. To be baptized in God’s name is to be baptized not by human beings but by God Himself. Although it is performed by human hands, it is nevertheless truly God’s own act (LC IV.10). Baptism is valid if Christ’s institution is followed, regardless of the one who administers the Baptism. Therefore, in cases of emergency, anyone can administer Baptism. The pastor has no special power to make Baptism valid. It is God’s Word that makes it valid. For proper order and administration, the church calls pastors to baptize, but where there is danger of someone dying without Baptism and a pastor is not immediately available, it falls on every Christian to step in and perform the Baptism. Because Baptism is a public mark of the church, such Baptisms will be reported to the pastor and recognized publicly by the congregation, but such a Baptism is valid and certain because it is God who Baptizes through human hands. Baptism is therefore a mark of the church. You can recognize a Christian church because you find Baptism there; Baptism through which we are saved. Scripture says, “Baptism now saves you.” (I Peter 3:21) Baptism saves because it delivers from sin, death, and the devil, and brings the baptized into Christ’s kingdom, and to live with Him forever. Baptism saves because it gives the forgiveness of sins that Christ earned by His death on the cross. Because Baptism saves, it is necessarily found in the Christian church. A Christian church is recognized as such because the mark of Holy Baptism is found there. God’s holy people cannot be without Baptism and Baptism cannot be without God’s people because Baptism saves and thus creates and brings into being the people of God. So where Baptism is, there God’s people are, and where God’s holy people are, there Baptism is treasured and held like a most precious gift from God. That is how you can recognize the true Christian church. Amen. Dear born again believers: grace, mercy, and peace to you from God the Father and our Lord and Saviour Jesus Christ. Amen. Jesus says that you must be born again to see the kingdom of God. There is no side-stepping or skirting around the issue. If you want to see the kingdom of God, that is, if you want to receive eternal life, you must be born again. Why must one be born again? Because what is born of the flesh is flesh. The sin that all mankind has inherited from Adam is in our flesh. Sinful parents cannot conceive sinless children. Thus the Psalmist writes, “Behold, I was brought forth in iniquity, and in sin did my mother conceive me.” (Ps. 51:5) The Holy Spirit tells us through the Apostle Paul that all mankind by their first birth are by nature children of wrath and enemies of God (Eph. 2:3; Rom. 5:10). Being born of the flesh means we are born as sinners into this sinful world, so we must be born again by the Spirit if we are to see the kingdom of heaven. The first birth is into this world of sin. The second birth is into the kingdom of God and everlasting life. We must be born again. We must be born of water and the Spirit. To be born of water and the Spirit means to be baptized. Baptism is a rebirth, as the Holy Spirit tells us through the Apostle Paul, calling it a washing of regeneration and renewal of the Holy Spirit (Titus 3:5). Baptism regenerates and renews; it gives a new life now and promises a new life in eternity. It is necessary because you must be born of the Spirit. The Holy Spirit must come into you and change you into a new person because without Him you are captive to sin, captive to death, and captive to the devil. You must be born again to be released from the bonds of the sin, death, and the devil. Does this mean that everyone who is baptized is born again? No, it does not mean that. It is possible to be baptized but reject the Holy Spirit by unbelief. The benefits of Baptism are received only through faith. Jesus says, “As Moses lifted up the serpent in the wilderness, so must the Son of Man be lifted up, that whoever believes in him may have eternal life.” Whoever believes has eternal life. If you are baptized but reject the Holy Spirit through unbelief, your Baptism does you no good; it is of no benefit to you. 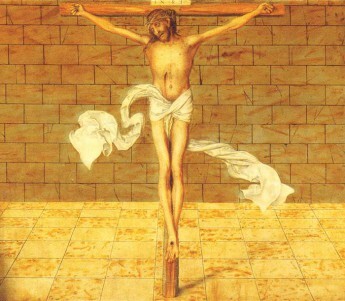 A believer, however, looks to the Son of Man lifted up on the cross. A believer looks with trust to Jesus on the cross because it was there on the cross that the price of our sins was paid. It was there on the cross that our punishment was laid on Jesus. It was there on the cross that Jesus earned us the forgiveness of sins and eternal life. How do we get that forgiveness of sins and eternal life that Jesus earned for us? Through Baptism. We receive it through Baptism because we are baptized into Jesus’ death and resurrection (Rom. 6:3,5). Don’t try to figure out how. You can never do it. You cannot put faith under a microscope. You cannot put God’s promises under a microscope. “Faith is the assurance of things hoped for, the conviction of things not seen.” (Heb. 11:1) In Baptism, we cannot see anything but water. We cannot see what God does in Baptism, but we trust His Word and His promises that He has attached to Baptism. Our faith is not in what we see, but in the promises of God. John’s first epistle tells us that everyone who has been born of God overcomes the world (I John 5:4). We may not always feel like conquerors of the world. When we suffer we do not feel like conquerors of the world. When we fall into sin we do not feel like we have overcome the world. Thankfully, overcoming the world does not depend on our feelings but on our faith. We may have to face dark and trying times in the world, but that does not mean we have not overcome the world. We may have to face anxious and difficult times in the world, times when it seems death is drawing near. But baptized into Christ, we are baptized into His death and resurrection. We will rise from the dead because He rose from the dead and we are baptized into Him. Jesus, my Redeemer lives; Likewise I to life shall waken. He will bring me where He is; Shall my courage then be shaken? We don’t have to worry about life or death. We are baptized into Christ, so we are members of the body of Christ. Christ rose from the dead, so we will also rise. Our fears or our feelings will not keep us from rising from the dead. Our sins will not keep us from rising from the dead. Jesus, our Head is risen. How could the Head rise and leave the members dead? We have nothing to fear. The Head will not forget about the body. Jesus will bring us to where He is. The fact is, we already have new life now. We have new life now because we have been born again by water and the Spirit. That which is born of the Spirit is Spirit. God has claimed us as His own through Baptism, by putting His name on us. The Holy Spirit has saved us through the washing of regeneration and renewal. He has washed away the old and put on the new. Thus, we will see the kingdom of God. We have been born again by water and the Spirit, so we will see the kingdom of God. There is no side-stepping or skirting around the issue. We have been born again because we have been baptized into Christ. Christ, our Head is risen from the dead, so we also will rise, and we will see the kingdom of God. Amen. Dear possessors of the holy Word of God: grace, mercy, and peace to you from God the Father and our Lord and Saviour Jesus Christ. Amen. The most important mark of the Christian church is that it possesses the holy Word of God. Without God’s Word, there is no Christian church. What would be taught and preached in the church if we didn’t have God’s Word? We have nothing without it: nothing to say, nothing to hear, nothing to believe. God’s holy people cannot be without God’s Word and God’s Word cannot be without God’s people. Jesus’ parable of the sower tells us that His Word will produce thirtyfold, sixtyfold, and hundredfold (Matt. 13:23). The Holy Spirit tells us through the prophet Isaiah that God’s Word will not return to Him empty or void, but will accomplish God’s purpose and succeed in the thing for which He sent it (Is. 55:11). So where God’s Word is, there the Holy Spirit is working through the Word to create faith; to make people holy. We also know from Jesus’ parable of the sower that even though God’s Word will produce faith, it will also be rejected. Three quarters of the places where the Word was sown produced nothing. The devil comes and snatches it away. Tribulation and persecution cause some to fall away. The cares of this world and the deceitfulness of riches choke the Word, and it proves unfruitful. Fault is not to be found with the Word, however. We know that the Word works. The Word produces faith. The Word produces thirtyfold, sixtyfold, and hundredfold. Where God’s Word is, there His holy people are, even if intermingled among them are those who do not believe. Even if God’s holy people are small in number, where His Word is preached, heard, and believed, there God’s holy people are; there is the Christian church. What happens if we have God’s Word but we neglect it? What if God has given His Word to us but we take it for granted, it ceases to be preached and heard, and it is not read or studied? Luther gives a warning concerning this to his countrymen: “Beloved Germans, buy while the market is close at hand! Gather while the sun is shining and while there is good weather! Make use of God’s grace and Word while it is here! For you should know this: God’s Word and grace is a passing downpour, which does not return to where it has already been. It has been with the Jews; but what’s lost is lost, and they now have nothing. Paul brought it to Greece; what’s lost is lost, and they now have the Turks. Rome and Latin-speaking regions have also had it; what’s lost is lost, and they now have the pope. And you Germans dare not think that you will have it forever, for the ingratitude and disdain will not let it remain. Therefore take hold and hang on tightly, while you are able to grab and to hold. Lazy hands are bound to have a hard year” (Letter to the Town-Councilmen, AE:45, 351-352). Written roughly five hundred years ago, Luther warned and predicted what in fact has happened in Germany. Their ingratitude and contempt for the Word of God has produced a society that is secular and godless. The state church in Germany, although Lutheran in name, has rejected the Word of God and they follow the world, their sinful flesh, and the devil. Like Greece, they also now have the Turk, as Muslims have overrun Germany and increased by 22% over the past couple years with mosques popping up left right and centre. This warning is also for us here in Canada. We have received the downpour of God’s Word and grace. Will ingratitude and contempt for God’s Word let it remain? The membership in our own church body is dropping significantly every year. We see among us in this congregation the membership dropping as people stop attending, and as we have many funerals every year and almost no Baptisms. Our country is also starting to get overrun with Muslims and their mosques as they come here and have children while we Canadians prefer money, careers, and pets to children, and either have them contracepted or murdered. Is this a call to take hold of God’s Word and hang on tightly, while we are able to grab and to hold? Yes, it is. Is this a call to repent over our ingratitude and contempt for the Word of God? Yes, it is. Is this a call to panic, fear, and despair? No, it is absolutely not! We have God’s holy Word, and where His Word is, there His people are. Small in number? Maybe so. Increasing in age? Maybe so. Decreasing in number? Maybe so. But God’s Word cannot be without His people. Where His Word is preached, heard, and believed, there God’s holy people are; there is the Christian church. God’s Word is so powerful, that even in heterodox church bodies where they do not teach God’s Word in its truth and purity, God can and does still have holy people. Even under the pope, who denies the Gospel and raises himself above the Word of God, even there, wherever God’s Word is believed, God works through His Word and saves people in spite of the pope’s best efforts to lead them to hell. The Word, the Word, the Word is what has the power to save. The Word has the power to save because in the Word and only in the Word do we know of God’s love for us in Christ Jesus. Only in the Word do we hear the Gospel that our sins are remitted for the sake of Christ’s death for us. The Gospel is God’s power to save (Rom. 1:16) and we know the Gospel only from God’s Word. The Christian church does not exist apart from the Word of God. Faith comes from hearing the Word of God (Rom. 10:17). Those who do not hear cannot believe (Rom. 10:14). Yet, in those who hear and believe, God’s Word produces thirtyfold, sixtyfold, and hundredfold. The Word of God is so powerful that it has wrenched you away from hell and its prince, the devil. The Word of God has produced faith in your heart so that you know all of your sins are forgiven. The Word of God is so powerful that on the Last Day it will raise you to eternal life as surely as it raised our Lord and Saviour Jesus Christ from the dead. The most important mark of the Christian church is that it possesses the holy Word of God. Without God’s Word, there is no Christian church. God’s holy people cannot be without God’s Word and God’s holy Word cannot be without God’s people, so where God’s Word is, there His people are. Where God’s Word is, there is the Christian church. Amen. Dear people who are tempted: grace, mercy, and peace to you from God the Father and our Lord and Saviour Jesus Christ. Amen. When the devil attacks you, it doesn’t feel bad to you. Yes, he prowls around like a roaring lion, seeking someone to devour (I Peter 5:8), but unlike a lion, when the devil attacks you, it does not feel like a lion’s sharp teeth crushing your bones or like a lion’s sharp claws tearing your flesh. If that were the case, you would never fall for the devil’s attacks or succumb to his temptations. You would flee his attacks because they would be painful. No, when the devil attacks, it feels good. He knows what your sinful flesh wants, and he offers it to you. He appeals to your pride, as he did when he tempted Eve saying, “You will be like God.” He appeals to your sinful desire for unchastity, laziness, gluttony and drunkenness, greed and deceit, anger and hatred. When he attacks you, your sinful flesh loves it. Your sinful flesh wants nothing more than to jump in head first into whatever the devil’s temptation is, regardless of the consequences. He dangles in front of your nose exactly what it is that you want; exactly what you think will make you happy; exactly what feels good to you. It doesn’t help that when you look around in the world, these are the things that the people of the world not only pursue, but they are the things in which they seem to take the greatest pleasure. Not only are the people of the world doing these things with pleasure, but there seem to be no bad repercussions or consequences whatsoever. So, what’s the big deal? Everyone else is doing it. Did God really say that exactly this is wrong? It’s just one bite of fruit, that hardly seems like such a horrible evil. The devil’s temptations always seem good. He doesn’t tempt us with things that appear bad, he tempts us with things that appear good and desirable. The devil tempted Jesus with things that appeared good. He tempted Jesus with food after He had not eaten for forty days and forty nights. The devil tempted Jesus to trust the protection of angels. The devil tempted Jesus to receive all the kingdoms of the world without having to suffer and die. These temptations all sound good. There doesn’t appear to be any harm in doing them. Jesus recognized the harm and evil in these temptations, however, and He did not fall into sin. Jesus saw through the devil’s temptations, and He knew what was right and what was wrong. Jesus did not do anything contrary to God the Father’s will, no matter how good it might have sounded to us. Jesus faced temptation and won. Unlike Adam in the Garden of Eden, Jesus did not fall into sin. Jesus did not eat what He should not have eaten. Adam ate from the tree of the knowledge of good and evil because there did not appear to be any harm in doing so, even though God had expressly forbidden it. Thus, Adam brought sin into the world, and Adam’s sin brought death and condemnation into the world. We have followed Adam. We have been fooled by the devil’s temptations. We have looked at his temptations and thought that they appeared good to us even if they are against God’s will. We have fallen into the devil’s temptations because they appeared so good to our sinful desires. We have excused our sin as something good because it felt good or because society has accepted it, everyone else is doing it, and there appear to be no consequences or repercussions. The devil even quotes Scripture in His temptations to make sin sound like it is God’s will. The devil knows what our weaknesses are. He then takes a passage from God’s Word and twists it to exploit our weakness. He is successful if we do not hold Scripture as a whole. He lifts a passage out of context and twists it to say something that it does not say. When we hear this twisted message, it stokes our sinful desires as the devil knows and intends. The devil wants us to think that our freedom in Christ is freedom to sin, and thus he seeks to destroy us through our own desires as they give birth to sin and bring forth death. However, God does not desire our eternal death. God does not want us to spend eternity in the death of hell. Thus, He cast Jesus into the wilderness to face the tempter. The temptations and desires that we have not been able to withstand, Jesus withstood. The desires that have given birth to sin in us never even took shape in Jesus. The sin that we have committed that has earned us the wages of death was never committed by Jesus. He faced the devil’s temptations and never even for a split second desired to do what He was tempted with. And it was necessary that Jesus never sin even in the face of the greatest temptations. If Jesus would have sinned even once then He could not have died for your sin or been punished for your sin. Then He would have died for His own sin and received punishment for His own sin. But Jesus never sinned. Parched and hungry, tempted in every way by the devil, Jesus never sinned. Thus, Jesus fulfilled God’s Law for you. He did what you cannot do. Jesus’ death, then, brought life for you. Adam’s one sin brought death for all mankind, but Jesus’ one act of righteousness – His death on the cross – brought life for all mankind. Adam’s disobedience made all mankind sinners, but Jesus’ obedience to the point of death has made you righteous. Jesus’ death for you has paid the penalty of your falls into temptation. Your sins have been covered with Christ’s righteousness in your Baptism. Jesus gives you a meal to eat that has not been forbidden you. He gives you His own body and blood for the forgiveness of all your sins. Through His Supper He also strengthens you in your fight against temptation, so that you will recognize sin to be sin and flee from the devil’s temptations, while daily drowning your sins and evil desires through repentance. The devil’s temptations may feel good to us, but we have God’s Word which tells us what is really good for us. Sin never ends up being quite as good as we had thought at first, but what God has in store for us is perfect and good. We may not always see the harm in doing something against God’s Word, but the harm and evil is there, even if hidden from our view. Cling to God’s Word in temptation. God knows what is best for you. Flee the temptations of the devil, the world, and your sinful nature. Seek God’s will from His Word when unsure of what is good and what is evil. Come and receive the Sacrament of the Altar. Jesus’ body and blood washes away every sin. Forgiveness is given from the altar for every time you have fallen into temptation. Jesus’ victory over temptation is your victory over temptation because His body and blood cleanse you of every sin. There are no strings attached. Simply free forgiveness, given and shed for you. Amen. Dear members of the Christian church: grace, mercy, and peace to you from God the Father and our Lord and Saviour Jesus Christ. Amen. How do you know that you have found a Christian church? There are all kinds of places around that call themselves Christian, and there are all kinds of places around that call themselves church. The question is that if you walk into any given church, how do you know if that place is a Christian church? There are all kinds of reasons why people are in any given church. Perhaps your parents attended there so you grew up attending there. Maybe you married someone who is a member there. Sometimes, simply the location of the building or the worship times are what make it convenient and that is why some people attend. Sometimes, people look for a church with lots of children or youth, skilled musicians, or a charismatic preacher. None of these things, however, really tell us whether the church is a Christian church or not. So what does? That is the topic of our midweek Lenten services this year. It is not a new question, and our seven-part sermon series is based on Martin Luther’s answer to this question. Luther identifies seven marks of the Christian church based on Scripture and points us to look for these identifiers in answering this question. The Office of the Keys has two sides to it, or two keys: forgiveness for the repentant sinner and the withholding of forgiveness from the unrepentant sinner. The need for the forgiveness of sins is perhaps the more understandable of the two. The Christian church is Christ’s holy people. How are people made holy? By the Holy Spirit giving the forgiveness of sins which Christ has purchased for us. Without the forgiveness of sins, we cannot be holy. Thus, if a church is not forgiving sins, it is not and cannot be a Christian church. Therefore, it is a sure and certain mark of the Christian church that the forgiveness of sins is there given. Christ sends ministers of His Word to speak on His behalf. The Absolution spoken by a pastor is not his own. As a man, a pastor cannot forgive sin. However, in his Office, having been called by the congregation to exercise the Office of the Keys – and thus being called by Christ Himself – his absolution is just as valid and certain, even in heaven, as if Christ our dear Lord dealt with us Himself. If a king sends a messenger to announce to a colony that has rebelled that they are forgiven their rebellion, the pardon announced is valid not because of the messenger, but because of the king who sent the messenger. So also, the called ministers of God speak God’s message of forgiveness, and this Absolution is valid and certain because the message is from God. We tend to view discipline in a negative light. However, we should not. Discipline is not a bad thing, but rather a good thing. After all, we believe disciplining children is good for them. Scripture tells us that when God disciplines us, He is treating us as His sons, and if we are left without discipline, we are illegitimate children and not sons. The Lord disciplines the one He loves, and chastises every son whom He receives (Heb. 12:5-11). God disciplines His sons to keep them from falling away from the faith, and that is also why God calls on the church to discipline those who are wandering – so that they will return to God from their wandering ways. The Christian church is also to discipline those who have fallen away from the faith so that they would realize their fall, repent, and return to the faith. Thus, it is a mark of the church that sin is rebuked and not tolerated. Open sinners are disciplined so that they would turn away from their sin and receive Absolution. Those who harden their hearts and refuse to turn away from sin are to have their sins bound so long as they do not repent. Nevertheless, should they at any time repent, they will never be refused forgiveness and the loosing of their sins. Christ has given to His church the Office of the Keys, by which the Holy Spirit makes fallen sinners holy. Those who fall into sin are to be restored again through repentance. The Christian church thus also offers private absolution to everyone who desires to make use of it. Public Absolution in the Divine Service gives forgiveness of sins to everyone who hears it. However, for those who struggle with particular sins for which they want to receive Absolution, or for those who want to hear a personal word of comfort, private Absolution is offered to give that comfort in the forgiveness of sins. It is important that you do not mistake struggling with sin as unrepentance. Struggling with sin is not the same as being unrepentant. Struggling with sin is a sign that the Holy Spirit is working in you. Struggling with sin shows that you do not want to do the sins that your sinful flesh craves. Struggling with sin shows that God is working repentance in your heart to turn you away from sin. Our struggle with sin will not cease in this life. Our struggle with sin ends when we give in and let sin rule over us, in which case we have fallen away from the faith, or our struggle ends when we die from this life and God takes us to be with Him in eternity where there is no more sin, so there is not more struggle with sin. To help us in our struggle with sin, Christ has given to His church the Office of the Keys. Unrepentant sinners are urged to struggle against sin and receive forgiveness, and repentant sinners who are struggling with their sins are absolved and given Christ’s true body and blood which strengthens them in their fight against sin and gives them the forgiveness of sin. Where the Office of the Keys is found, there the Christian church is found because there God leads sinners to repentance and gives the forgiveness of sins. Where the Office of the Keys is used, there the Holy Spirit is working to make people holy. Where the Office of the Keys is, there you should be, because there is a Christian church. Amen.